Cherisse Tanno says, "Awesome, great prices, on time! Very friendly and great to work with!" Sherman A. Baisa says, "Outstanding professional equipment, set up and take down. Recommended to contact them for your occasion. Mahalo for the great job at the Upcountry Farm Fair, Aloha to you both!!" 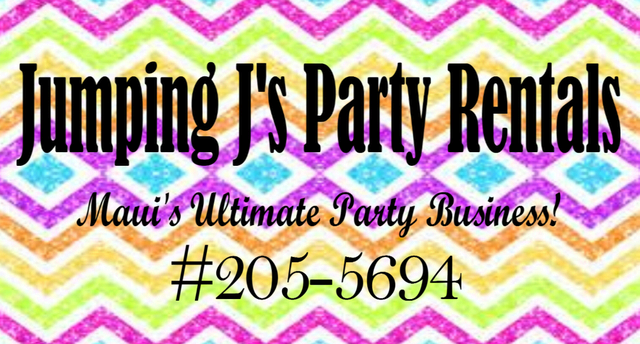 Tia Perdido says, "The BEST prices, fun castles, and the most ALOHA spirited people you'll EVER meet :) YOU CAN'T EVER GO WRONG WITH JUMPING J'S PARTY RENTALS"
Duane Ramos says, "The best jumping castle company out there and the owners are so nice and super friendly, It's a must company to go with for any party activity..."
Kelliann Ah Puck says, "Castles are AWESOME and their service is top of the line!! Plus the owners are WONDERFUL people :-)"
Gavin Manoa says, "Clean, professional, Good prices, Variety... some of the many ways to describe Jumping J's!!! And let's not forget... so much FUN!!! Love Jumping J's"
More reviews coming soon! don't forget to leave your comments after your rental, on your survey, so we can learn how to better serve you!